It was a boys night out for David Beckham and his sons Brooklyn, Romeo and Cruz on Friday night! 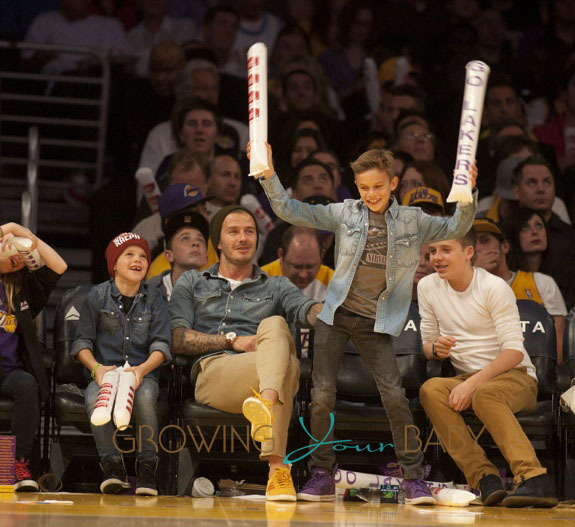 The Beckhams looked to be having a great time sitting court side to watch the Los Angeles Lakers play Phoenix Suns at the Staples Center in Los Angeles, California. Never one to shy away from the spotlight Cruz got up doing halftime and danced on the floor with his noise sticks. Not to be outdone, Romeo got up and showed off his moves as well! If the rumors are true, the Beckhams will be leaving LA at the end of the year. After five years with LA Galaxy David is reportedly not renewing his contract and will decide the next few weeks whether to accept one of the offers from France, Italy, Russia, the Far East and the Premier League. We’ll definitely miss the whole family hanging out in the box cheering their dad on at the LA Galaxy games!